A Sydney-based property developer has been awarded an international property award for its resort-inspired residential building in Parramatta. Crown Group’s much anticipated 590-apartment residential tower, V by Crown Group won the Five Star Award for Residential High Rise Architecture Australia at the 2016-2017 Asia Pacific Property Awards earlier this month. Positioned in the heart of Parramatta, the stunning structure better known as Parramatta’s Vertical Village rises up on two V-shaped columns, each standing a striking three storeys tall; ensuring key elements of Parramatta’s historical and cultural past including the remains of an 1840s convict house and underlying convict hut found during excavation are kept and displayed for public view. Forming a distinct new landmark in Australia’s second oldest city, the development’s residential tower houses a diverse mix of 590 apartments and hotel suites, cleverly arranged to optimise light and space; alongside residents’ amenities including swimming pool, gymnasium, library and media rooms. On level-26, a cocktail bar features sweeping views of Parramatta’s Heritage parklands, Sydney’s CBD and Sydney Harbour Bridge. Particular care has been taken with the bar’s acoustic treatment, public access, servicing and optimal use of space; resulting in an expansive 275sqm internal bar area, double height ceilings, a large outdoor terrace and a stunning glass wall forming a unique backdrop behind the bar service area designed to take advantage of the bar’s sky-high position. The tower’s lower levels feature a grand cathedral-like lobby with a four-storey high atrium space and a retail-and-dining plaza. Crown Group CEO, Iwan Sunito, said the award acknowledged Crown Group’s commitment to architectural design. “V by Crown Group goes beyond the ordinary to deliver a 21st century urban lifestyle experience in the second oldest city in Australia,” Mr Sunito said. "We strive to push the boundaries of conventional design, to create a revolutionary, breakthrough buildings. "This award is a recognition of V by Crown Group’s unique design," he added. Mr Sunito, who is also an architect, has often expressed his desire to use innovative designs rather than to simply follow designs of the past. Designed by international architects Allen Jack + Cottier (AJ+C) in collaboration with the Japanese-born architect, Koichi Takada, V by Crown Group is is set to become distinct new landmark in Australia’s second oldest city, located on the corner of Macquarie and Marsden streets Parramatta. Three expansive luxury penthouses occupy the two highest levels of the building, some of the most exclusive positions in Western Sydney. Each penthouse is set over two floors and includes three bedrooms, a study, two bathrooms, a guest powder room, open-plan kitchen, indoor-outdoor living area, two car spaces and a large balcony. 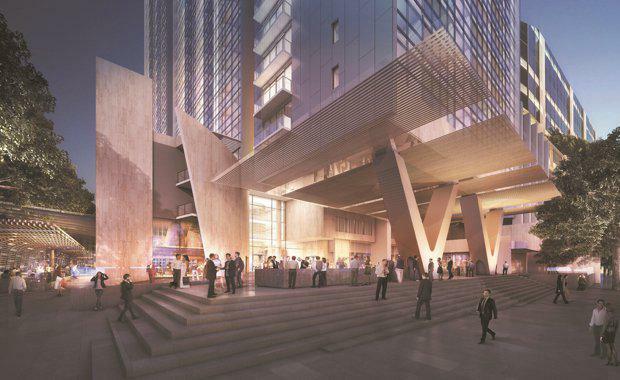 “The landmark tower which has become known as Parramatta’s Vertical Village provides truly glamorous high-end level of apartments that matches the lifestyle of those new residents of Sydney’s second CBD,” Mr Sunito. The International Property Awards celebrate the highest levels of achievement in the property and real estate industry; judged by experts from across numerous property disciplines including architects, designers, and journalists. Entrants in the High-Rise Architecture category are judged on design brief and site considerations, location, architecture and use of space, appearance and finish, sustainability, safety and security.